After installing everything and as you notice I also connected the server, site and database, I can not add admine or can not give any bans. I put "amxbans_use_admins_file" on "1" to test the bans. Usage: amx_banip <steamID or nickname or #authid or IP> <time in mins> <reason> "
[AMXBans] amx_ban <Time in Minutes> <SteamID> Nickname> <Reason> "
[AMXBans] You are not authorized to ban via Console. " Please help me, I do not understand why it does not work, considering everything is valid. And just the problem with mysql, but I noticed that other server owners appear, but it works! In conclusion: I can not add admine and can not give bans (from the site itself and after the server)! 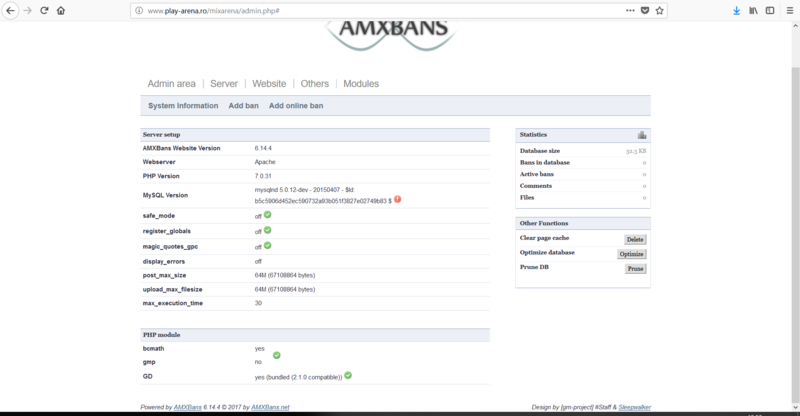 [AMXBans] You are not authorized to ban via Console." 1. There's no problem with database table, can't see any problem. 2. Have been noticed that navigation isn't working in some devices. Thank you, will be fixed. 3. When you change admin input it's necessary to restart server. Is there anything I can help you more or didn't answer yet? indianiso1 wrote: 1. There's no problem with database table, can't see any problem.